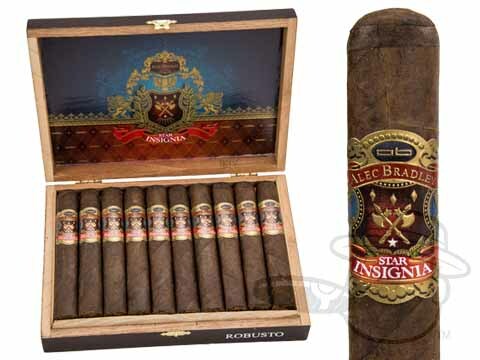 The Alec Bradley Star Insignia Robusto is tagged with free shipping. If you order this product, your entire order will receive FREE BCP Ship Saver shipping! Dark chocolate, crisp cedar, and bold spice come alive in Alec Bradley's Star Insignia. Described by some as a darker and richer companion cigar to the 96-rated Prensado, the masterfully box-pressed Star Insignia balances a unique fusion of select Honduran and Nicaraguan leaves cloaked in a dark and supremely rich Jalapa Valley Habano leaf for a showstopper smoke that builds in complexity and intensity as you burn. When an average cigar just won't cut it, reach for Star Insignia and call it a celebration. This is my second box of these cigars and it again did not disappoint. Smooth for a med-full. I don't rate many things 5 stars but this was close. Hands down, one of the greatest smokes I've had in a long while. Decent price point for what you get. KEEP COMING OUT WITH THESE GREAT HOUSE BRANDS! While I am just a new cigar smoker, this little box robusto does pack a ton of interesting flavor from start to finish. It provides an even burn throughout the whole cigar. A real treat for me and I get excited when I am able to order it again. It is a more dark and rich smoke with enough to keep you interested during the whole smoke. It is not forgettable or a one-note-wonder. I am a fan. Give it a shot! My only problem was the uneven burn. Okay smoke for the money. Nice taste, not too harsh on the tongue. Pretty nice deal for a freebie. Great cigar. Wonderfully constructed, long burning. Good taste. A very good cigar that does not satisfy my taste, as it is Mario which my son-in-law enjoys.I never had an appreciation for madoro. Full bodied, long lasting light! A good tasting cigar. Nice draw and smooth follow through. Pleasant surprise. I get aromas dark cocoa and spice. I smell some coffee, earth, fruit, leather, and cinnamon. Flavors: raisin,leather with a touch of nuts; burnt almond. Almost marzipan because of all the sweetness occurring in this stick, cocoa, coffee, jalapeno, green pepper, and creaminess. You're getting a $9 cigar for $6. Solid cigar for med-full bodied cigar. had a great taste easy smoke and an even burn. Received a 5 pak as a bonus item and was absolutely amazed. Very good taste, burns perfectly. Price point a little high. Alec Bradley Star Insignia Robusto is rated 4 out of 5 based on 27 customer ratings.